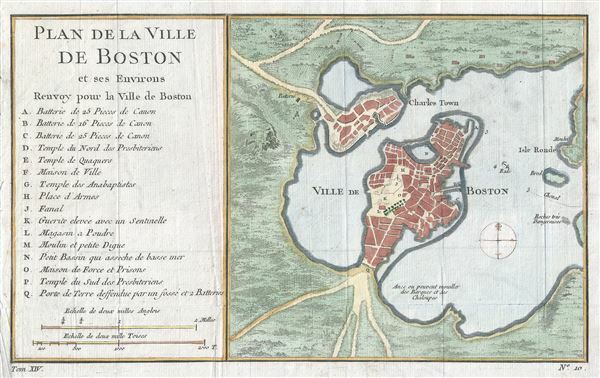 This hand colored map is a c. 1756 map of Boston, Massachusetts. Attributed to French cartographer Jacques-Nicholas Bellin, this map was issued for the French edition of Provost's Histoire des VoyagesÂ…. Beautifully rendered in stupendous detail. Shows Boston and Charlestown as well as parts of Isle Ronde and the mainland. Important destinations identified with letters that correspond to a key to the left of the map proper. These include three cannon batteries, the Presbyterian Church, the Quaker temple, the Anabaptist Church, the City Hall, the Armory, Faneuil Hall (Spelled Fanal), etc.. Published as plate no. 10 in volume XIV of Provost's Histoire des VoyagesÂ…. Bellin would later issue a very similar version of this map in his 1764 Petit Atlas Maritime. Provost, A., L'Histoire Generale des Voyages, 1756, Vol XIV, plate 10. Also issued in Bellin, J. N., Le Petit Atlas Maritime. Recueil de cartes et plans des quatre parties du monde. Very good. Original platemark visible. Minor wear along original fold lines. Boston Public Library, Leventhal Map Center, G3764.B6 1757 .P5.